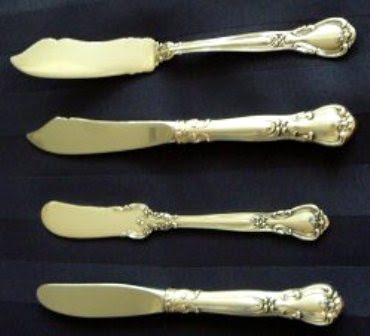 Master butter knife - used to transfer butter from a common serving dish to an individual diner's bread plate. This knife typically will have a sharp point to be used to "spear" a butter pat, I suppose. It is not used to spread butter onto bread. Individual, or place, butter spreader - used to spread butter onto bread. Each place setting will have one of these for use by a single diner. A spreader normally will have a rounded tip. Solid or flat-handle - typically means that the utensil is one solid piece, all made of sterling. Hollow-handle - means that the utensil is constructed more like a dinner knife, probably with a sterling handle and a stainless steel blade. With Notch - references the little notch in the blade that you see in the two master butter knives in the above picture. With No Notch - means that there is no notch. Some patterns include both options. The utensils often will look exactly the same except for the notch. Modern blade - means that the blade resembles the blade of a modern place knife. Paddle blade - means that the blade has a different, more rounded shape. French blade - may be a variation of the paddle blade. Below are pictorial examples. The Chantilly butter spreader on the left is a hollow-handle spreader with a modern blade. We call the Chantilly spreader on the right a hollow-handle butter spreader with a paddle blade. However, some might define the blade as a French blade because of the way the sharp edge of the blade leaves the handle (taking a 90 degree turn away from the handle, then another 90 degree turn up the blade edge). In addition to knives and spreaders, there are butter picks. Below are pictures of two examples. The top butter pick has a single tine while the bottom butter pick has two tines. So, the bottom line here is to be careful when buying butter utensils to make sure you are getting what you want! Click on any picture to see a larger version. By clicking on "Comments" below, you can see posted comments and add your own questions/comments. However, I just happen to see a picture of a BUTTER PICK? This utensil as stated above, has a stainless tine and the handle, half inch wide and at least thick, is marked with an " A (SCRIPT) and "STERLING". What is it? HELP! Can you email us a picture? If so, click on "Email Silver Jim" in the right column. the reason ppl call them butter knifes and not dinner knifes is simple. its been many years scence anyone has use a real butter knife. most just use a dinner knife and tell there kids there butter knifes and so on. in Canada. no one uses real butter knifes and most just get left in the box as an oddity. i fear even my children's children will continue the practice.